On the national trend that are gourmet burritos, the argument could be made that sticking out of the pack of burrito restaurants is a difficult thing to do. Uh, extremely difficult actually. Do we dare claim that our small town happens to have a burrito joint that could hold its own against similar establishments in the state – nay – country? I mean, are we really going to go there? Look, we know we’re not burrito experts but then again the concept is so simple – tortilla wrapped around certain ingredients – that the subject shouldn’t be that hard to master neither on the creation side nor the consumption side. But the reason for our bold assertion is based on a restaurant that isn’t afraid to be bold, in fact, that’s what it strives for. It prides itself on its creativity and quality, and it should. 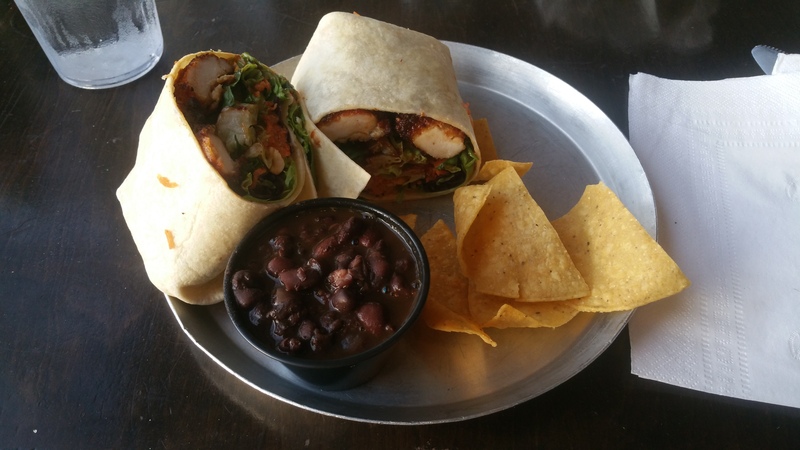 Not only did the place we are featuring this month master the burrito concept, it’s one dissertation away from being awarded a Ph.D.
Black Sheep Burrito and Brews opened roughly four years ago and has been wildly popular among the locals and visitors to the area alike. It’s been so popular, in fact, that a second location is enjoying a lot of success an hour away in Charleston. Spend some time in there and you’ll find out why it’s one of the most recommended places in town. In addition to the food, we can’t review Black Sheep Burrito and Brews without saying a word about their drink menu. While I’m (kati) not a big beer drinker, I can totally respect 13 brews on tap and the local flair Blacksheep offers with breweries from WV and other surrounding states. Furthermore, I can fully attest to the fact that their margaritas are my favorite in town, and be sure to look for special seasonal flavors, too — like strawberry, rhubarb! Oh, something else that stands out; we get a lot of out of town guests that happen to be vegetarian – our number one suggestion is always Black Sheep – kudos to them for being mindful enough to offer so many non-meat options! 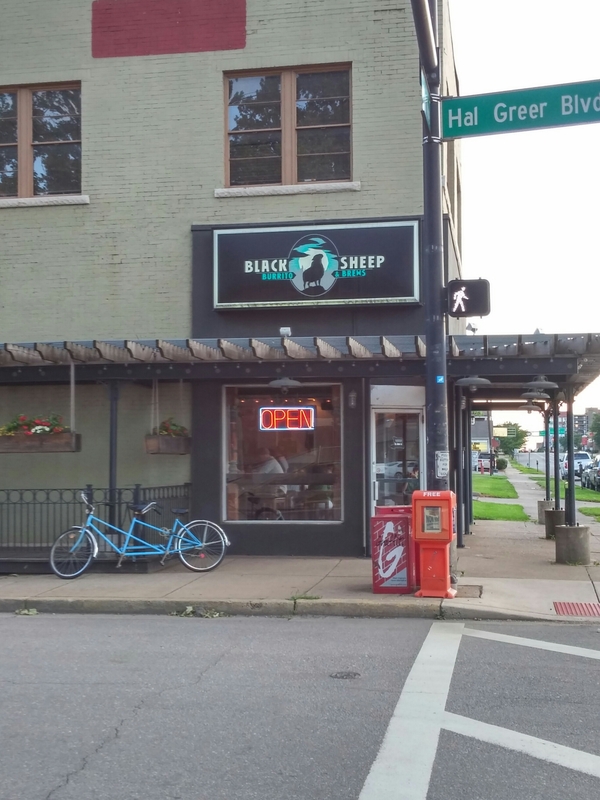 The space itself has been home to some near-campus favorites in the past and Black Sheep has filled those shoes wonderfully. The restaurant is large with many tables, a long bar, and has great (and often elusive in Huntington) outdoor seating. Eye catching art adorns the walls, cheerful patrons fill the seats, tremendous atmosphere, and the place just teems with personality. With Black Sheep, they are telling you “hey, we’re going to pair up some stuff that you probably hadn’t thought about putting together, and, really, you’re just going to have to trust us.” So you trust them, and more importantly, they deliver. Though not technically on the appetizer portion of the menu, we read over the description of these Specialty Wings (which are relatively new to the menu) and we couldn’t flag down our server fast enough! These jumbo wings would have been phenomenal by themselves as they were plump, juicy, and incredibly tender. But spicy apricot reduction? Bourbon bacon marmalade? Yes, please. The glaze was neither too spicy nor too sweet but boasted a distinct combination of flavors that we both loved. The bacon marmalade added a brand new dimension to chicken wings that i didn’t realize had been woefully missing my entire life. Not only did it add to the intensity of the flavor, but made for a much more robust texture. These will definitely be featured on our blog when we do our Battle of the Wings segment down the road, and as of right now, they look to be the wings to beat. For a place that is known for burritos, we admit that we tend to favor their tacos more. 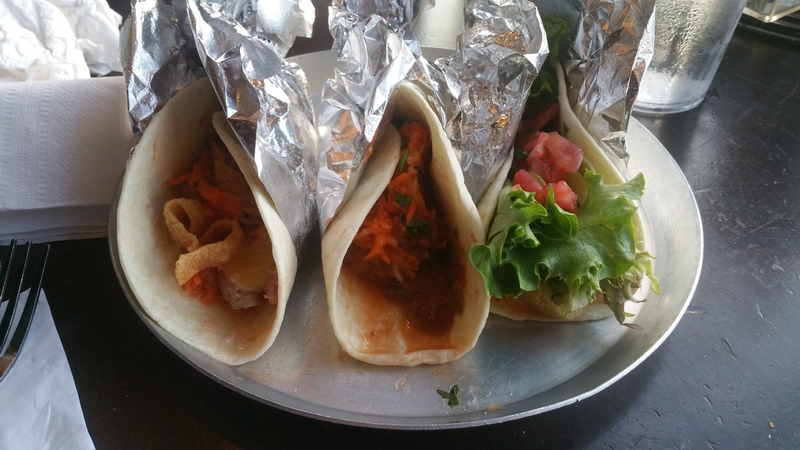 The Flock of Tacos is the term used when you get to pick three from their list of 15 stunning tacos. This is my go-to for a couple reasons, I really enjoy diversity in a meal plus… I haven’t met a taco there I didn’t like! This time, I tried a new menu item: cashew crusted seared tuna. The taco has a good amount of tuna on it so it’s a hearty four bites. The slaw is the same as what is on my second taco: the thai shrimp. I will say that this slaw is a bit overpowering, but that doesn’t bother me because I love it! It’s a vinegar base and it goes wonderfully with fish. The tuna is more of a fresh flavor whereas the thai shrimp is heavier since it’s battered and fried. It also has peanut-hoisen sauce which I adore. Finally, I got the tempura-fried avocado taco. Each bite has a creamy, crunchy feel and the textures are perfectly paired! Overall this is a solid burrito but i must admit, after reading the description i was anticipating a little more “oomph.” The parts that stuck out were the chicken with a lot of flavor and the spring mix that really added a fresh quality to the fold. The carrot relish sweetened it a bit and the cashews provided a nice intermittent crunch; i think the kung-pao sauce took over a little too much but did combine the ingredients together in a nice Asian-Latin fusion. Although I got the flock the first time around and try not to repeat items, it was a breeze for me to order it again with 3 different varieties! The blueberry brisket from Black Sheep is something I could eat by the tub full. Unfortunately a taco is not the best transportation device for large amounts of beef, but even the small portion the tortilla did deliver pleased my buds. Paired with slaw, this slightly sweet morsel that is one of the less eccentric menu items is sure to satisfy almost anyone. The portobello taco is actually my favorite of my top 6. Yes, a mushroom taco is the BEST taco! It may seem odd to some, but the mixture of this marinated ‘shroom and tasty black beans with a sprinkle of cheese and one crunchy wonton is both something I never saw coming, but I also do not want to say goodbye to. The final taco was the baja fish. Tempura fried with crunchy, red cabbage, this fish taco isn’t going to win a medal for the best I’ve ever had, but it’s safe to say I enjoyed every bite! As Black Sheep mentions, everything is made from scratch, so don’t be in a hurry. But with this said, our food took exceptionally long to come out. Thankfully, our server made it up to us by comping part of our meal, and even better — it was open mic night! While we were lovin’ our food, our ears were delighted by blues, poetry readings, and an eclectic mix of tunage. The room was lively with clapping, laughter, and smiles. I was actually recommended this specialty sandwich by a friend and thought it was worth a shot. I think much more of this friend after this recommendation. Everything about this sandwich just works. The puree adds a cool consistency, the relish and cucumber a splash of crispness, and i really appreciated the sesame-ginger mayo. 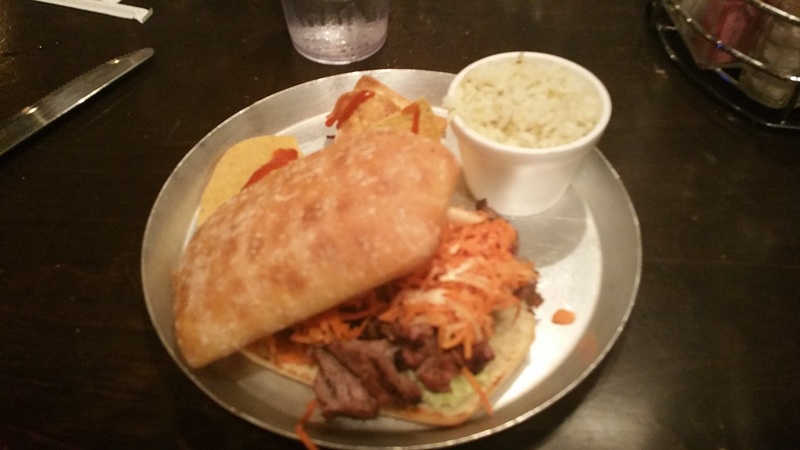 But let’s not forget about the star of the show, the marinated skirt steak… it’s ridiculous, man. Tender and packed with flavor. Has got to be one of the better sandwiches around. This section of their menu should not be overlooked and brings to the forefront just how diverse this restaurant really is. It’s much easier to be good at just one or two things but the way they’ve nailed down burritos, tacos, sandwiches, chicken wings, and other things we’ve not even highlighted is rather impressive. 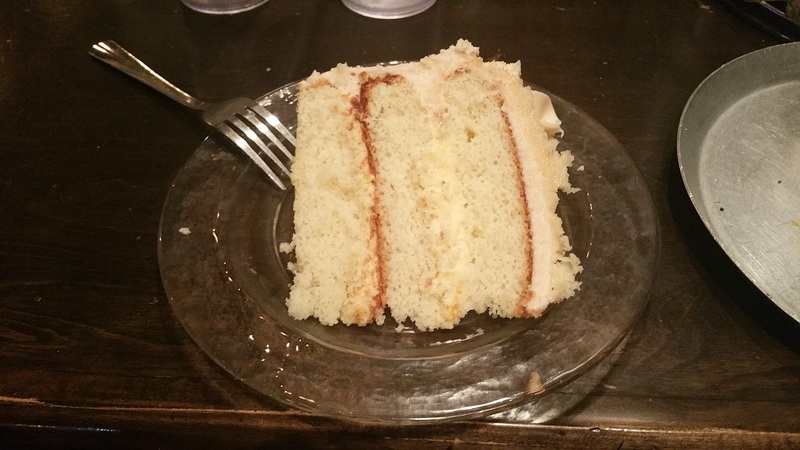 We aren’t sure why we have never had a peach cake, but one bite into this fluffy, light treat made us think long and hard about why in the world the flavor isn’t more popular. I (kati) particularly enjoyed it because the icing wasn’t too sweet and overpowering. And i (will) loved it because there was a lot of that icing and it was almost like biting into a peach. WHEN TO GO: Lunch and dinner are great times to go, but we have to recommend the weekend brunch as well as the open mic night on Sunday – fantastic environment. BEST PART: Atmosphere; creativity of the food. WHAT SETS IT APART: The awesome personality is what really sets it apart. Well the awesome personality and the top-notch food is what really sets it apart. Well the awesome personality, top-notch food, and forward-thinking attitude towards the art of casual cuisine is what really sets it apart. ROOM FOR IMPROVEMENT: Obviously, we are big fans. If we had to choose where they could improve it would be on their sides. The beans and the rice can be a little bland, and we would like to see sides offered with the Flock of Tacos. 3.5 Tandems/ halfway between Wow! and Amazing! HINT FOR NEXT MONTH’S BLOG: Quarterly we will step away from highlighting just one restaurant and do what we call a battle. We pit different restaurants’ similar items against each other and determine a winner (if we can make a decision). Next month we’ll be trying to figure who offers the best ________ (combine two words together to figure it out).